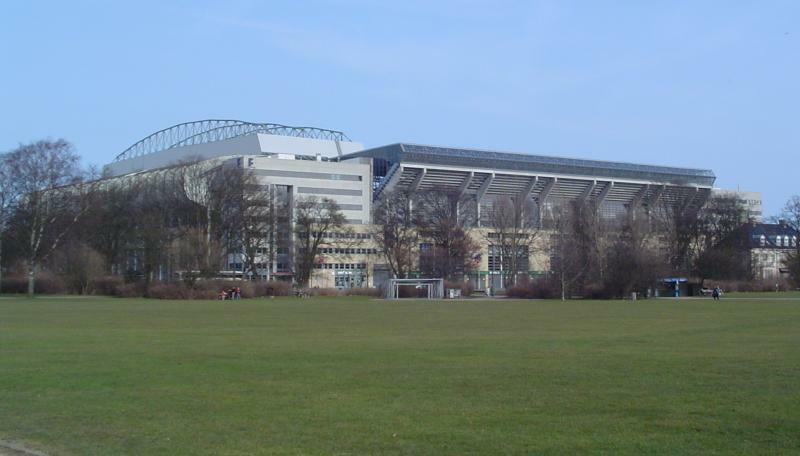 Telia Parken is the largest football stadium in Denmark, the home of FC Copenhagen, and the standard playing venue of the Danish national team. 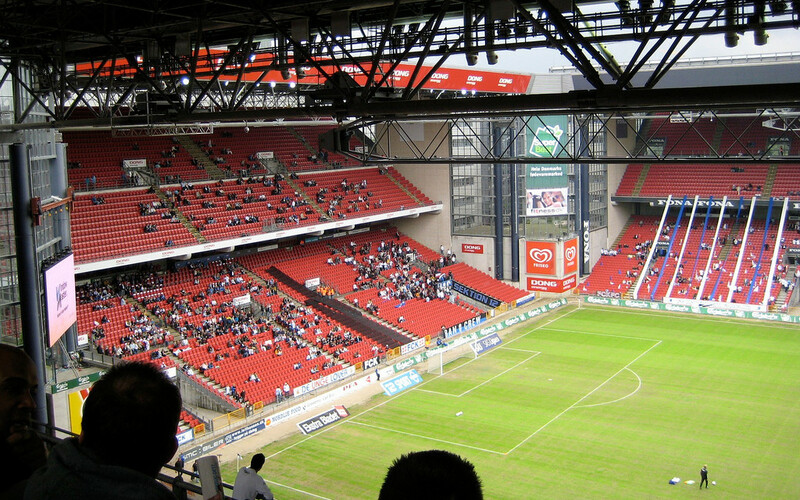 Parken was built on the site of Denmark’s previous national stadium, Idrætspark, which had stood there since 1911. Demolition of the old stadium started in 1990, with the new stadium finished in 1992. Only the old main stand remained part of the new stadium, but because the pitch had turned 90 degrees became one of the short ends. Furthermore the 16 bottom rows of seats were removed to be make space for a stage to host concerts. An extensive renovation made it fit in with the new stands. The new stadium officially opened on the 1st of September 1992 and was renamed Parken as this was how the old stadium was already referred to by most people anyway. 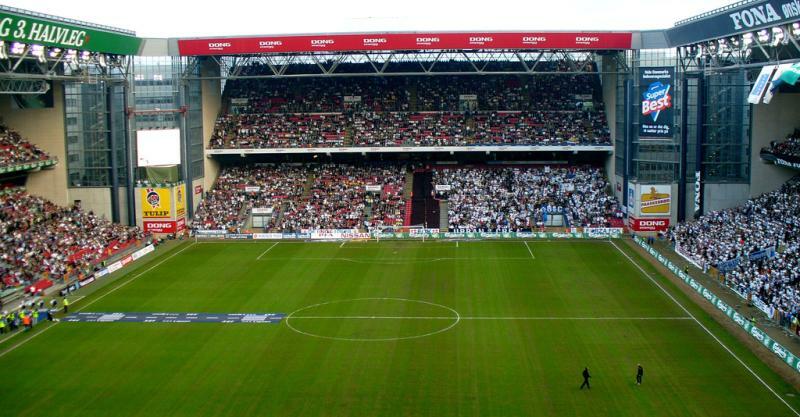 In 1994, Parken hosted the Cup Winners’ Cup final between Arsenal and Parma (1-0), and six years later, in 2000, the UEFA Cup final between Galatasaray and again Arsenal (0-0). Between 2007 en 2009 the remaining old stand was demolished and replaced with a new stand. This reduced capacity of the stadium, but increased the number of corporate and VIP facilities. 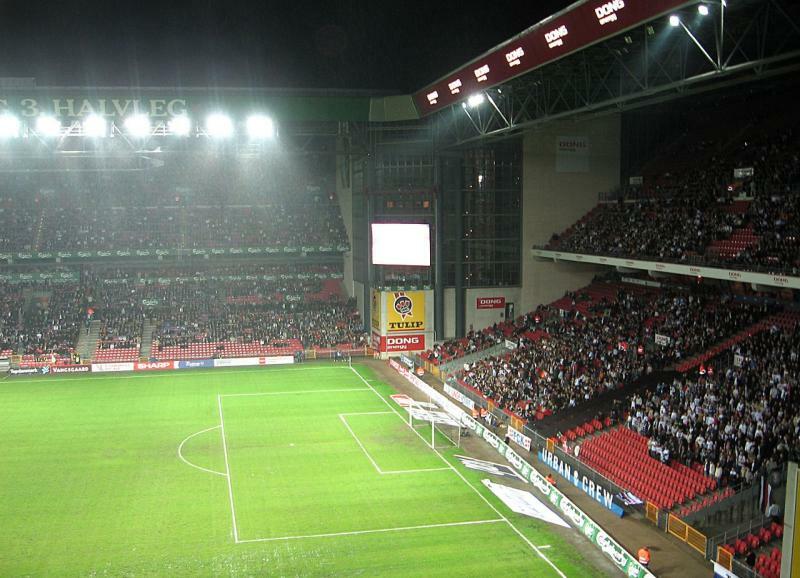 The stadium got renamed Telia Parken in 2014 following a sponsorship deal with communications company Telia. Telia Parken has been selected as one of the playing venues of the Euro 2020 Championships which are played across Europe, hosting three first round group matches and one round of 16 match. Telia Parken is located north of Copenhagen’s city centre, about 4 kilometres from the main rail station and 2.5 kilometres from the northern parts of the city centre, the Kastellet citadel, and the little mermaid statue. Parken is located at walking distance from Østerport train station. Trains leave from Copenhagen’s main rail station every few minutes for the 6-minute journey to Østerport. From there follow the main artery Østerbrogade north to get to the stadium. The walk will take about 15 minutes. From the main rail station one can also take bus 15 to get to the stadium. Take the bus in the direction of Østerbro (Ryparken), and, after a 15-minute ride, get off at stop Parken. From City Hall Square (Rådhuspladsen) one can take bus 14 in the direction of Svanemøllen (Sløjfen). Get off at stop Trianglen and walk 10 minutes over the Øster Allé north towards the stadium. Line 1A and 3A also stop at Trianglen. Telia Parken is located in a predominantly residential area. It is bordered by the large Fælledparken park, which is very pleasant on a summer’s day and holds a few cafés. The Østerbrogade avenue, which runs east of the stadium, is lined with shops and the occasional bar, café, and restaurant. Obviously, the options pale in comparison with those in Copenhagen’s city centre. Hotel Rye is situated a small walk from the stadium. It is a basic hotel that get decent reviews. First Hotel Østerport is a rather similar alternative that is located near Østerport train station, and therefore also at walking distance from the city centre. For all hotels near Parken click here. Staying in Copenhagen’s city centre works fine as well. There are particularly many hotels around the main rail station, from where you can catch a train to Østerport. Tickets for FCK games can be bought online, or at the FCK Fanshop at the stadium. Tickets are also available at the ticket office on the day of the match. FCK don’t usually sell out apart from the derby against Brondby. 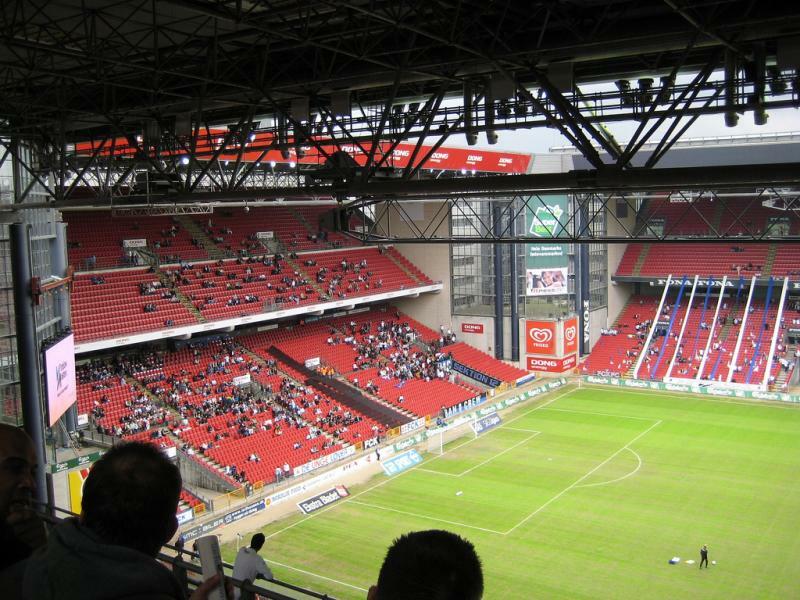 Tickets cost either DKK 135.00 for a seat behind the goal, or DKK 185.00 for a seat at the long side. Tickets are DKK 40.00 more expensive if bought on the day of the match. For more information email kundeservice@billetlugen.dk. FCK.dk – Official website of F.C. København. Parken.dk – Official website of Parken. Visitcopenhagen.com – Copenhagen tourist information. Moviatrafik.dk – Information about Copenhagen bus travel. Rejseplanen.de – Public transport journey planner. Went to watch FC Copenhagen against Aalborg last weekend. Tickets are available online and you can print them at home. I decided to buy my ticket on the day, because I collect the stubs from all games I go to. Prices go up by 40 DDK when you buy tickets on the day so it is cheaper to get them earlier. Stadium itself is nice and big. Support is loud but attendances are really poor. I walked from train station Osterport(exit the station, turn left and walk 15 minutes until you see the ground on your left hand side). In Copenhagen literally everybody speaks English! I have never been in a place like this. Beautiful city with a nice stadium to visit.